Peninsula Equine Services (PES) is deeply committed to the highest standard of equine care. Dr. Julie Page and her staff take pride in providing alternative health care that supplements and complements medical and surgical procedures. Our goal is to offer the latest in preventive care, chiropractic and therapeutic laser services, medical and surgical referrals, client education and excellent customer service, both in-office and in the field. Dr. 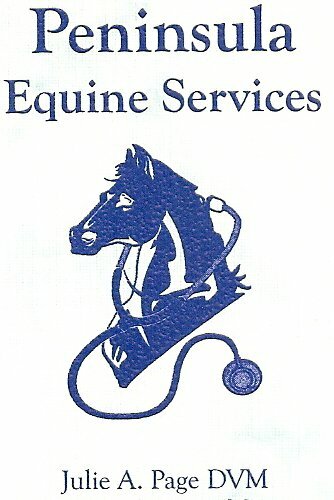 Page is a licensed veterinarian as well as certified in equine chiropractic and trained in therapeutic laser treatment. Because of her expertise in multiple veterinary disciplines, she is able to provide a "holistic" approach to your horse's health care.